South Korean electronics giant, Samsung days ago released its new collection of mobile gadget the Samsung galaxy A5 smart phone. 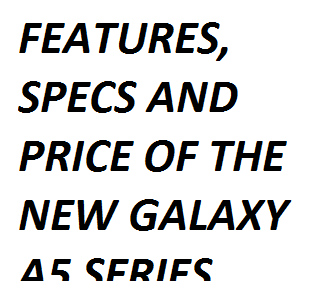 The galaxy A5 will be taking the place of last year's model of Samsung galaxy A series. Though the A5 series comes with the same glass/metallic fabric of the 2016 editions of the A-series. The galaxy A5 series comes with some many features from its recently released Galaxy s7 series. One iconic feature from the s7 series that featured in the A5 series is the water and dust proof bodies. The A5 series has an improved battery capacity of 3000mAh and a super fast charging feature. The galaxy A5 series has a 5.2 inch screen with an AMOLED 1080p gorilla face. The gadget is quite handy with a weight of 159grams. The gadget features a home button just below the screen embedded with a finger print scanner with its capacitive navigation keys sitting on the sides. These buttons on the sides of the gadget are backlit. According to GADGETS360, Manu Sharma, VP, Samsung Mobiles, stressed that the glass back panels draw on Samsung's "premium design heritage". GADGETS360 also confirmed from Samsung's VP that the galaxy A5 series gadget will feature Samsung pay, Samsung's payment system which is now live in India. The galaxy A5 series comes with a RAM size of 3gb and an internal memory of 32gb. There is an external memory expansion slot of up to 256gb. The gadget will also have access to storage of 15GB using the Samsung cloud app. The Samsung galaxy A5 series comes with a 16 mega-pix rear camera and LED flash light, it also features an internal camera with f/1.9 apertures. This device has a whole lot of connectivity features. Accordingly, GSMARENA quoted Samsung as saying the device specifies a Cat.6 LTE (300Mbps downlink, 50Mbps uplink), with a disclaimer that it may vary by region and carrier, and since the EXYNOS 7880 itself supports Cat.7 you may want to check locally if the 100Mbps DL speed is of such crucial importance to you (you know who you are). Worthy to mention is the dual band WIFI a/b/g/n/ac, NFC and MST for it's inbuilt Samsung pay feature, an FM transmitter and version 4.2 Bluetooth. The charging port is a Type-C port, and USB OTG is compatible for attaching peripherals. The galaxy A5 series endured a 16 hour test during a video playback test and holds itself for 14 hours when connected to a wifi device. It is just so superb to note that the device scored an overwhelming mark with its 95h overall result in an endurance rating test carried out on its battery. There isn't any major altercation when it comes to software packages in the Galaxy A5 series. Multiple of Android apps could be used on the gadget without slowing it down, as well as maximum speed during internet browsing and multitasking. The new Galaxy Samsung A5 series will be officially available for sale all over the globe come March 2017. The price for the gadget in Nigeria will likely fall between N140,000 and N150,000.